← Digital Distraction: Are Smartphones Dumbing Down Students? 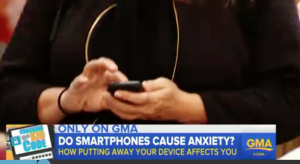 Nancy Colier, a psychotherapist and author of the book, “The Power of Off,” emphasized to ABC News that the long-term dangers of this anxiety remain largely unknown. This entry was posted in Magazine and tagged anxiety, cellphone, cellphone use, cortisol, cyberbullying, dopamine, internet addiction, meditation, mindfulness, nancy colier, power of off, smartphone, social media, teens and text. Bookmark the permalink.